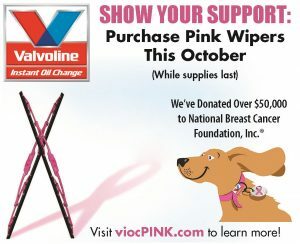 haverhillchamber.com | Valvoline Instant Oil Change offers pink wipers for National Breast Cancer Awareness month! Valvoline Instant Oil Change offers pink wipers for National Breast Cancer Awareness month! Valvoline Instant Oil Change is raising funds and increasing awareness for National Breast Cancer Foundation, Inc. ® (NBCF). Throughout the month of October, Valvoline Instant Oil Change will be selling pink windshield wipers with a portion of the sales donated to NBCF. Now in its fifth year, the campaign has raised more than $55,000 for NBCF. The blades come in traditional black with a small pink ribbon or full pink for those who wish to make a bolder statement. They fit 98% of cars, trucks, and SUVs manufactured after 2003. Valvoline Instant Oil Change will be kicking off the month long campaign October 1st with a ‘Pink Out Day’ including pink give-a-ways and a double donation for every pink wiper blade sold that day. Visit your local store this month and get your pink wipers!